It’s a testament to how well-loved E.B. White’s classic children’s tale Charlotte’s Web is when Hollywood stars of the calibre of Julia Roberts, Steve Buscemi, John Cleese, Oprah Winfrey, Jennifer Garner, Kathy Bates, Dakota Fanning and Robert Redford agree to lend their voices to it. The simple tale of young girl named Fern who saves a pig named Wilbur from the chopping block, and who in turn makes friends with a wise a spider named Charlotte, has enchanted youngsters around the world since it was first published in 1952, and was previously made into an animated film in 1973 with songs by Richard and Robert Sherman. This new version, which mixes live action with Babe-like animal CGI, was directed by Gary Winick, and features a delightful score from Danny Elfman. 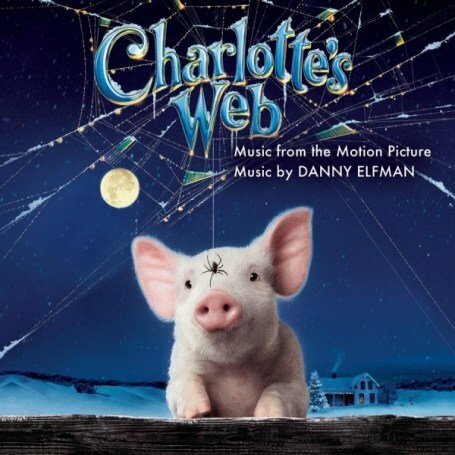 For many admirers of Danny Elfman’s early work, like myself, Charlotte’s Web will be received as a wonderfully nostalgic throwback. There’s a permeating sense of playfulness, innocence and good-humour throughout the entire score, and admirers of scores like Edward Scissorhands, Sommersby, Black Beauty, The Nightmare Before Christmas, and recent works such as Big Fish and The Corpse Bride, will find much to enjoy. The core of the score is orchestral, with heavy emphasis on strings and piano, but there are also a number of specific instrumental aspects which gives the score its personality: light pianos, pizzicato violins, chimes, harps, xylophones, and a soft choir add ‘magic’, while guitars and fiddles to illustrate the wholesome Americana farmland setting. After a delightfully frenetic opening full of spry energy, the main theme appears in the second cue, “The Introduction”. A pleasant, soothing motif for strings and choir, it gives the Wilbur character an instantly likeable, inquisitive and endearing personality. Dakota Fanning, the film’s lead actress, sings the gentle “Lullaby”, which segues into the mischievous “Escape” action sequence, and is filled with familiar Elfmanesque string writing, before moving on into “Introducing Charlotte”, which again is filled with more of the ‘magical’ orchestrations. “Templeton” the rat has his own sneaky-sounding motif underpinned by a bass flute. The caper-like “The Plan Begins” recapitulates Wilbur’s theme with a more prominent cooing choir in truly delightful fashion, while slightly anarchic set pieces such as “In the Mud”, “Some Pig” and “The Dump” bring a little life and effervescence to the story. Their upbeat, increasingly flamboyant stylistics flourish with comedic gay abandon and spikier orchestrations which at times recall the dynamic cartoon writing of Carl Stalling and Scott Bradley. The finale, “Wilbur’s Homecoming”, is easily one of the standout cues written for any film in 2006, an 8-minute master class in how to successfully enchant and overwhelm a listener with beautiful orchestral and choral writing of the highest standard. Anyone who is familiar with Elfman’s career as a whole will understand when I say it’s up there with “The Grand Finale” from Edward Scissorhands and the finales from Sommersby and The Corpse Bride in terms of its wintry beauty and enormous emotional content. Even the score album’s song, “Ordinary Miracle” – written by former Eurythmics member and occasional film composer David A. Stewart and popular lyricist Glen Ballard, and sung with great depth of feeling by Canadian vocalist Sarah McLachlan – is very good indeed. McLachlan’s voice, which cracks emotionally at high ranges, has made her one of my favourite regular movie-song singers, and anyone who enjoyed her work with Randy Newman on Toy Story 2 will surely like this too. It may be apparent that I am struggling to think of anything negative at all to say about Charlotte’s Web. It’s a truly delightful and engaging score, chock full of all the things which first made Danny Elfman popular over a decade ago. The themes are lovely, the performances top-notch, and the sense of fun and playfulness, coupled with the stellar final cue and the pretty song, makes it an entertaining listen from beginning to end. It offers nothing groundbreaking or original – just a solid album of engaging music, and a perfect accompaniment to a well-loved tale. Music composed by Danny Elfman. Conducted by Pete Anthony. Orchestrations by Steve Bartek, Edgardo Simone, David Slonaker and Marc Mann. Recorded and mixed by Dennis Sands. Edited by Bill Abbott and Jay Richardson. Album produced by Danny Elfman.